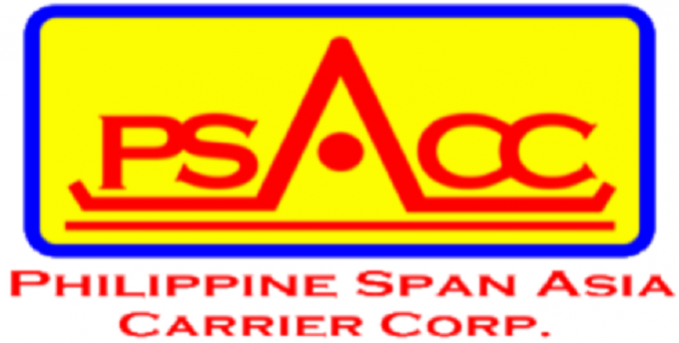 Philippine Span Asia Carrier Corporation. (formerly Sulpicio Lines Inc.). 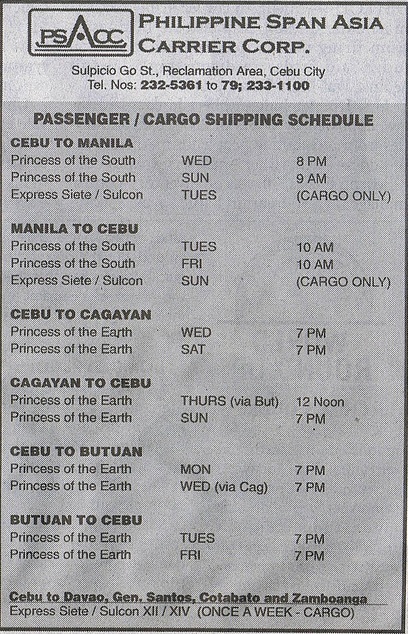 For your trips to Cebu, you may embark on the Philippine Span Asia Carrier Corporation (PSACC). Don Sulpicio Go established Sulpicio Lines in 1973 after working as a general manager for the Gothong Shipping Company, which is owned by his brother Carlos. Sulpicio Lines was created to assist in the country’s economic progress by providing indispensable linkages among the islands. Inter-island shipping remains an important and affordable means of transporting people and goods in the Philippines. As a family corporation, PSACC is currently being run by the second and third generation successors of the founder. The executives are still involved in the everyday operations of the business to provide their clients the best services. You may contact PSACC at their office on Sulpicio Go St., Reclamation Area, Cebu City, with telephone numbers (032) 232-5361 to 79. My name is Niño Rasi Galamiton, 22 years of age and a resident at Poblacion, Concepcion, Sierra-Bullones, Bohol. I am a fresh graduate from the Philippine Maritime Institute at Tagbilaran City, Bohol of the course Bachelor of Science in Marine Engineering and I would like to take my apprenticeship under your respected company. I believe that I can acquire valuable knowledge and skills to complement those that I have learned in school under your company and I can improve it through your offered trainings and activities. In change, I will offer my service and determination to be an asset to your company throughout the duration of my apprenticeship period. I will be honored to come to your office for an interview at your convenience. You can reach me through my mobile phone number, 09098527861 or my email address, [email protected] I am looking forward to hearing from you. Enclosed is my resume which states the required trainings that I have accomplished. 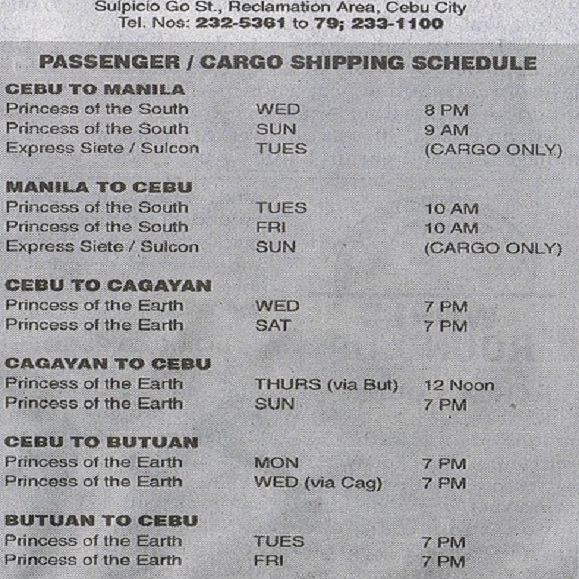 is sa philippine span asia carrier still in operation with their passenger? I mean contact numbers po for PSACC Manila, thank you! Good day! Pwede po ba makahingi ng Contact numbers either Landline or Cellphone. Di na po kasi maka-contact sa PSACC for Inquiries. Di ko po alam kung nagpalit na po sila ng numbers. Thank you! As previously stated, Everything Cebu is not affiliated with PSACC. Please directly call the numbers posted in the write-up. Please directly call the numbers posted in the write-up about PSACC. Everything Cebu is not affiliated with them. We are sorry to hear about that unfortunate experience, James. Perhaps you should call and look for their supervisor. I called Sulpicio/Philspan no. 241-97-01 answered but i wasnt able to reach the person i want to talk too for about 30 minutes . she hanged me on the phone without getting back.All i want is to inquire cause i want to send shipment domestic via sea.tsk tsk tsk. Poor Service!!!!! With Poor Performance of Telephone Operator whoever she is….she needs seminars..how to handle customer. The only contact information we have is their landline numbers. You may call them at (032) 232-5361 to 79.
they dont have email add? Please directly contact Sulpicio Lines because Everything Cebu is not affiliated with them. We have posted the numbers in the write-up. gud day sir! ask ko lng kng mgkano bayad ng owner type second hand jeep mula manila-general santos city at kng ano ang schedule.thnx & more power! Since Everything Cebu is not in any way connected with Sulpicio Lines, we cannot provide you with that information. It will be better if you directly call the shipping company using the numbers in the write-up. Good luck! Hi, Jahle! 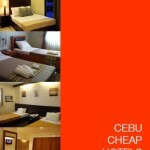 To know their rates, please directly call Sulpicio Lines at (032) 232-5361 to 79. Hi, Zeny Velesrubio! Everything Cebu is not affiliated with PSACC. Please directly call the numbers posted in the write-up. Good luck! 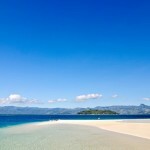 how much fare manila to cebu including travel taxes? Thank you for that input. Everything Cebu is not associated with Sulpicio Lines. 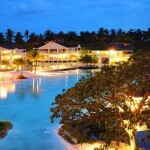 We featured the company as part of the list of shipping lines in Cebu. You mean the murderous Sulpicio Lines? I wouldn’t board one of their ships even if they were holding a pistol against my head.